We’ve only gone and done it……. In just under 1 year, North Walsham Play have raised the £90,000 needed to bring about the second new play park for North Walsham. Order processed this week and work should start in early September. 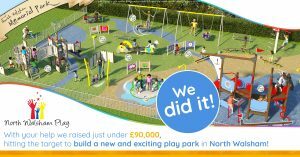 Any additional funds received between now and then will be used to increase the number of seats on offer as well as look to increase the bank of swings. Thank you to everyone who has believed in us and supported us.